Left to ponder the unusual vegetable, I inspected the display, sniffed the achochas, rattled one, tossed it into the air, caught it, then added two more to my selection. Why not try this curious new vegetable? I have learned to love the achojchas! Hollow and fleshy like a pepper, they have a subtle cucumber aroma. They keep for more than a week at room temperature, are great to stir fry with other vegetables, work well with soups and sauces, but the best bonus is their stuffing ability! The options are endless! They can be stuffed with a meat or seafood-quinoa mix or filled with a spicy spinach-mushroom cream cheese mixture. While having lunch at a friend’s house, we were served achojcha traditionally stuffed with a rice-cheese mixture that also contained a surprise: a hard-boiled egg! I asked many people, “What is this vegetable? Is it a vine? Does it grow on a tree? What color is its flower?” Everyone called it, “achocha” then shrugged. An answer arrived through a cyberspace forum reply! The mysterious achojcha, sometimes called caigua, is scientifially classified as Cyclanthera pedata. 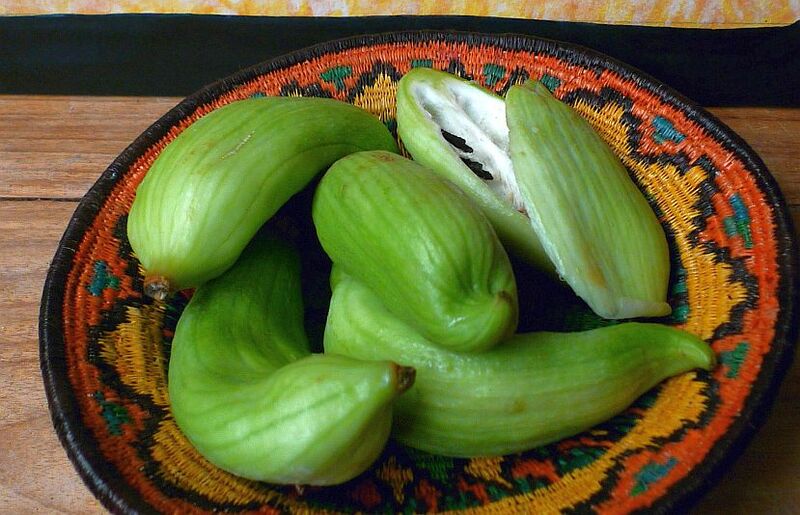 Now popular in other areas of the world, its many names translate to Stuffing Cucumber, Sparrow Gourd, Slippery Gourd, Crows Beak and more. Achojcha’s health benefits range from lowering cholesterol and blood pressure to helping eliminate cellulite! Reported to grow up to 40-feet high in tropical climates, the achojcha has the potential of soon claiming the side garden of my house! The leaves are edible, so I’d best start finding ways to prepare them! 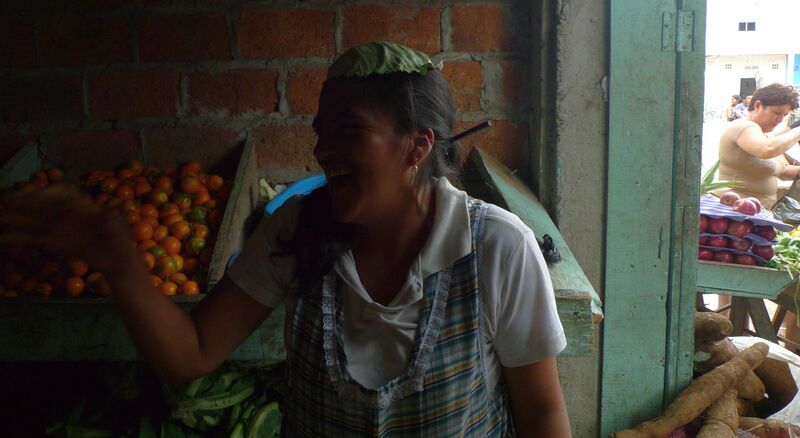 Below: Enjoy a photo trip to Maria’s vegetable market in Manabi, Ecuador! hmmm..sounds yummy, will definitely look for them next market day. Did you nstart your own plants from seeds? 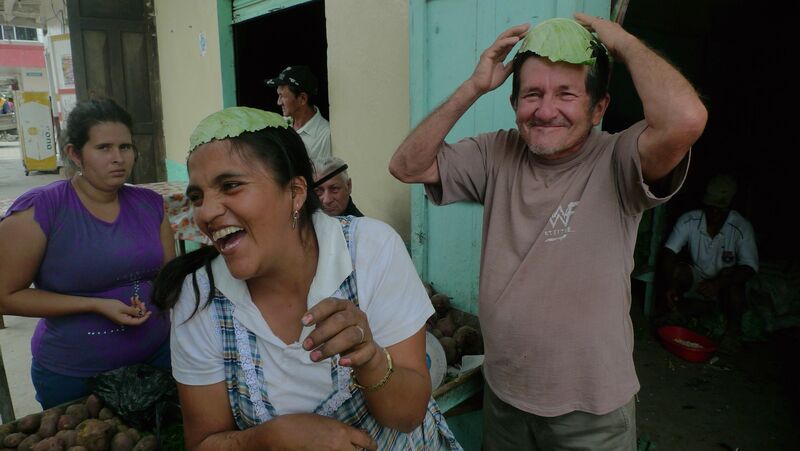 hey amigos! your tales of your cultural immersion are so great! you should start a blog as well! These sound yummy…so far haven’t been able to find them at the Charapoto market. If you could, please save a few seeds for me and I’ll plant them in our garden here in San Clemente… just started a large selection of seeds that a friend brought for us from the States…I’ll pop you an email with a list and you can let me know if you’re interested in any of the plants. Will definitely put together a small herb pot for you with dill, parsley, chives and lemon grass. I will be happy to save some seeds! 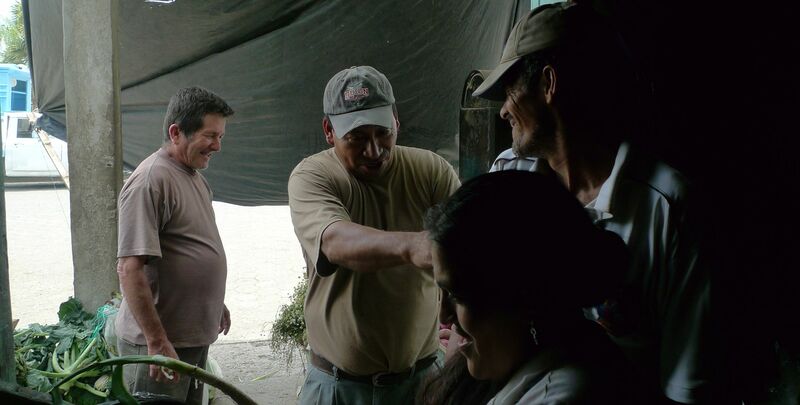 The first crop, planted in the dry season, became the iguana’s favorite hors d’oeuvre! The second planting has struggled from so much moisture and lack of sun. I see achojcha in town about once a month, though the last batch seemed affected by disease – no surprise with all of this rain! Maybe this is the “strange” plant I have growing. It grows a lot like a cucumber and is usually a very pale green. Inside are several row of dark (dry) seeds.